In ’83, my first fall as a guide I worked for Rich Guthrie in the Brooks Range and my first client was a bow hunter from Ohio. On the second day of his hunt I spotted two trophy bulls moving down the mountainside coming our way. I found a good place to intercept them after they crossed the small creek at the bottom of the valley floor. It turned out even better than I thought and the hunter had a great shot at 20 yards. He shot right over the back of the largest one. They took off and we never caught up with them again. As a new guide I was disappointed; however I learned that’s the way it sometimes goes. He did take a moose on that hunt. Later in the month, I worked for Tracy Vrem on the Alaska Peninsula. My first client took a 65” moose and then we made a great stalk on a super caribou bull. He made a one shot kill at 150 yards. It scored 390 B&C points. Needless to say, we were both pleased at the outcome of his hunt. Ted Epley from ID with his 390 point B&C caribou. Once we were back at the lodge, I was ready for my second hunter who was looking for a moose. He scored with a 61 incher. Tracy had an old Jeep at the lodge that he let me use for my third hunter who was after caribou. There were numerous old roads in the area that were used back in the day for oil and gas exploration making it easier to cover the surrounding area. He scored with a very nice bull. Carroll Lilly from TX with another nice caribou. In October of ‘83 I was farther down the Alaska Peninsula in the Cold Bay area working for Rich Guthrie again. I ended up taking a Grumman Freighter Canoe across Izembek Lagoon where Donnie Smith and I took David Morris and Steve Vaughn from GA up the right hand valley of the Joshua Green River. Both were hunting for a brown bear and caribou. As we were making our way up the river we spotted a group of caribou with only one good bull. Dave was our shooter. Donnie, who was a crack-up, had been guiding for five years. He said to me, “You don’t try to do a real stalk on caribou do you?” I said, “Of course, I always try to get as close to every animal as I can.” He said, “You can just stand up and walk toward them and if the wind is right you can always get within 200 yards, or so.” He said, “I’ll show you,” so Dave chambered a round at about 400 yards out and all four of us started walking toward the biggest bull. They kept looking at us but not moving until we were within 200 yards and Dave, using my pack for a rest, made a well-placed shot and down went his caribou. I told Donnie I thought it was more fun for the client and the guide to make a serious stalk on caribou and that I thought you had a better chance of taking a caribou that way. I have always done what it takes to get close to any bull. About five days later Steve and I made a great stalk on his beautiful long beamed 396 point B&C caribou. The next day after my friend and guide Tom Jesiolowski was mauled by a brown bear, Rich dropped Tom’s client Chip from GA, off for me to guide him for caribou. We ended up taking a very nice bull with a giant shovel. All three clients also killed a brown bear. Dave Morris from GA with his trophy caribou. Dave is the host of “The Bucks of Tecomate” on the Outdoor channel. Steve Vaughn from GA with his 396 B&C caribou. Chip from GA with his giant shoveled caribou. 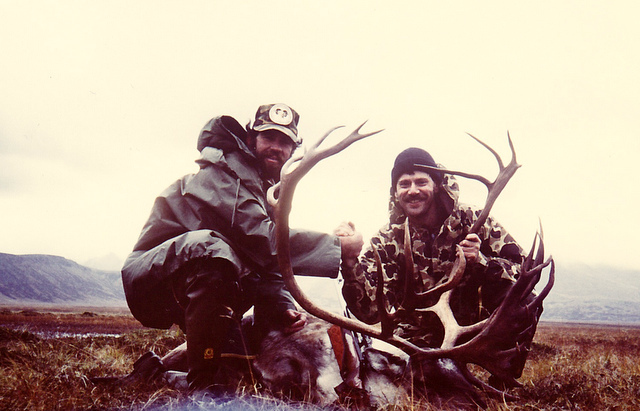 The fall of ’85 was AAA Alaskan Outfitters first caribou season in the Cold Bay area. Four of our clients harvested nice caribou but no big ones. John White from TX took a caribou with the strangest shaped antlers that I have ever seen. We called him “pop eye.” I guided John again in our Western Alaska area in ’88. John White from TX with “pop eye,” Brent and me. We didn’t know it at the time but the southern Peninsula caribou herd was crashing. Three years later the Alaska Department of Fish & Game ordered an emergency closure on that caribou herd. We never hunted it again. 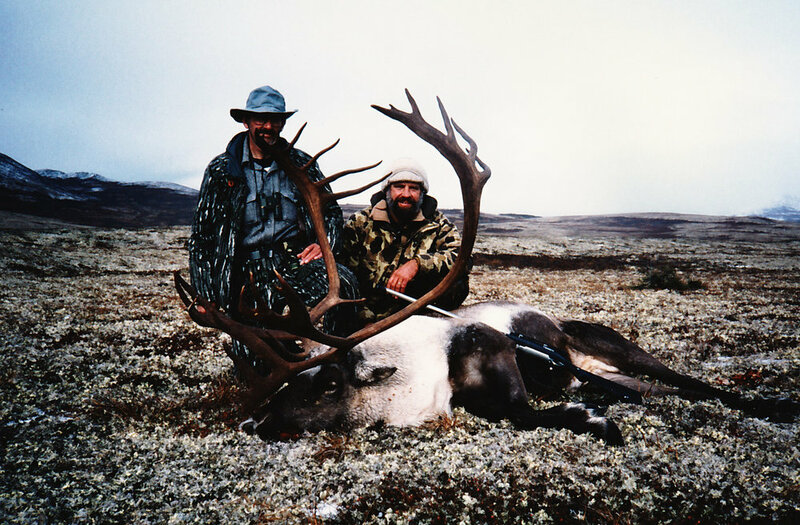 In ’87, Tony Lee, owner of Westwind Guide Service allowed Brent and me to take two hunters in his Western Alaska area. We were thinking about purchasing that area. My hunter was Leonard Anderson from WV. He harvested my first B&C Record Book caribou. It scored 403 B&C and 444 SCI. He also harvested a 57” moose. Leonard Anderson from WV with his 403 B&C Record Book caribou. That winter we bought the area from Tony Lee. That was when I truly got to do my favorite of all time caribou hunting. We were hunting the Mulchatna Caribou herd. In 1987 it was estimated to have around 20,000. During the next seventeen years we would see the herd peak at around 250,000 then drop back to 80,000 the year we sold the Otter Lake Camp to Rick and Denise Grant of Tikchick Airventures. In 1988 we were still learning the area. We took some nice caribou but no record book bulls. I guided John White to a really nice 388 B&C. John White from TX with his 388 B&C caribou. It had the darkest antlers that I have ever seen. In ’89 I hunted out of main camp with Ron and Ken Hayden from CO. They were both using black-powder flintlocks. 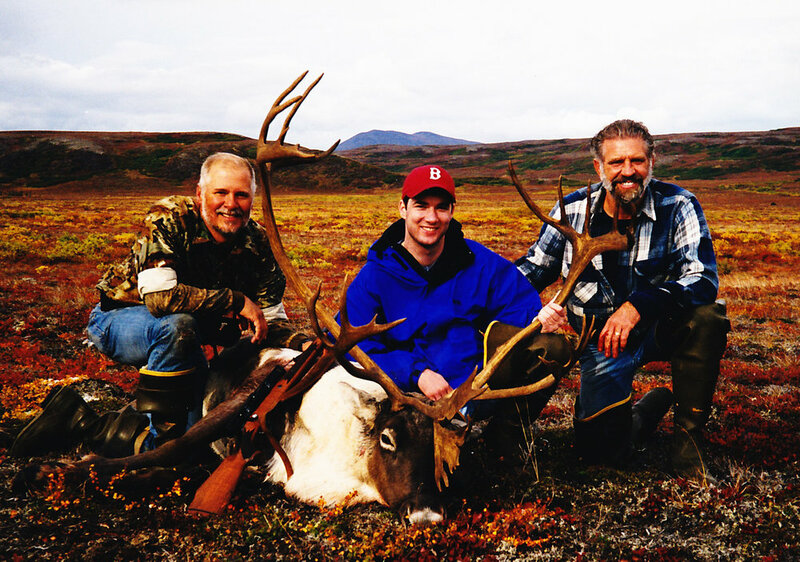 What a thrill it was to slip to within 75 yards of a 376 point B&C caribou with Ron Hayden. As we laid there in the wind and rain I was wondering if the rifle was going to fire. When the caribou stood up Ron pulled back the hammer and squeezed the trigger. I heard a “thud” and turned to look at Ron and all of a sudden there was a loud roar and we were covered in blue smoke. As the smoke was disappearing the bull fell to the ground. What a blast! Ken also took a nice bull and both bulls made the top 10 in the Muzzle Loading Record Book. Ron’s was number 5. Ron Hayden from CO with his 376 B&C taken with his flintlock. Ken Hayden from CO with his trophy caribou taken with a flintlock. In 1990 I guided Tom Cosgriff from NJ to a large beamed bull in velvet. That one scored 390 B&C. That was also the year that Tim Orton and his nine year son Frank took two beautiful bulls less than 10 yards apart. That was really a fun hunt. After they left I took my pastor Walter Davidson on a hike to what we called “the chalet.” On our way back we stalked to within a 100 yards of a 370+ B&C bull which Walter easily took down. AAA harvested two B&C Record Book caribou that year. Tom Cosgriff from NJ with his 390 B&C bull. It is in total velvet. Nine year old Frank and his father Tim Orton from MN with two super nice trophy caribou bulls. My pastor, Walter Davidson from Anchorage, with his 370 B&C trophy caribou. 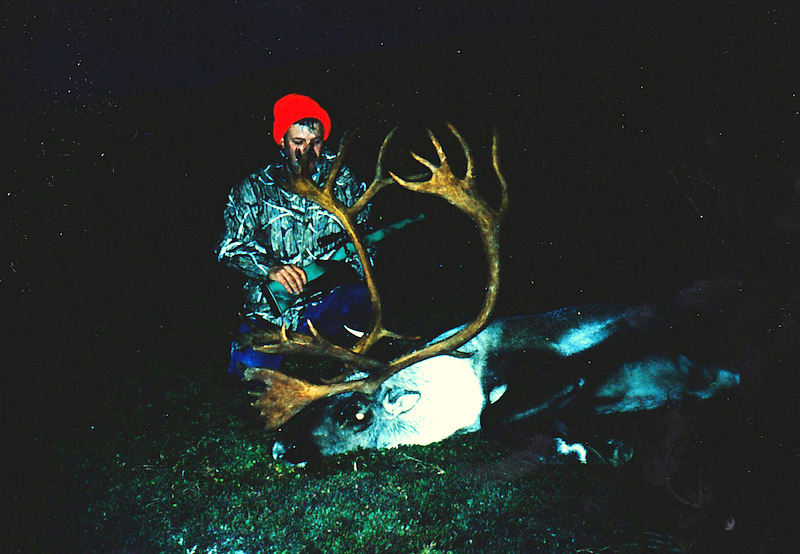 1991 was truly a special year for me when it comes to caribou hunting. I guided John Herr from ND on the first part of his three specie hunt. We hunted out of main camp and on the same hill that Ron Hayden had taken his caribou bull, John and I slipped up on the largest caribou that I had ever seen. At a 150 yards John made a great shot and scored with a giant 427 point B&C Record Book bull. That was AAA’s largest that year and my largest ever. I had hired Ron Watts to come in and guide John for brown bear and moose. My wife Karen was in camp and we ended up hunting her last two days over in the Klutuspak Creek area. We slipped to within a 150 yards of a really long beamed bull in a herd of 2000+ caribou. Karen made a great heart shot. This was her first animal and it was a B&C Record Book bull. It officially scored 403 2/8 B&C. I couldn’t have been prouder. That indeed was my favorite hunt. AAA harvested six B&C Record Book caribou that year. It just kept getting better. John Herr from ND with his 427 B&C Record Book caribou. My wife Karen with her 403 2/8 B&C Record Book bull. 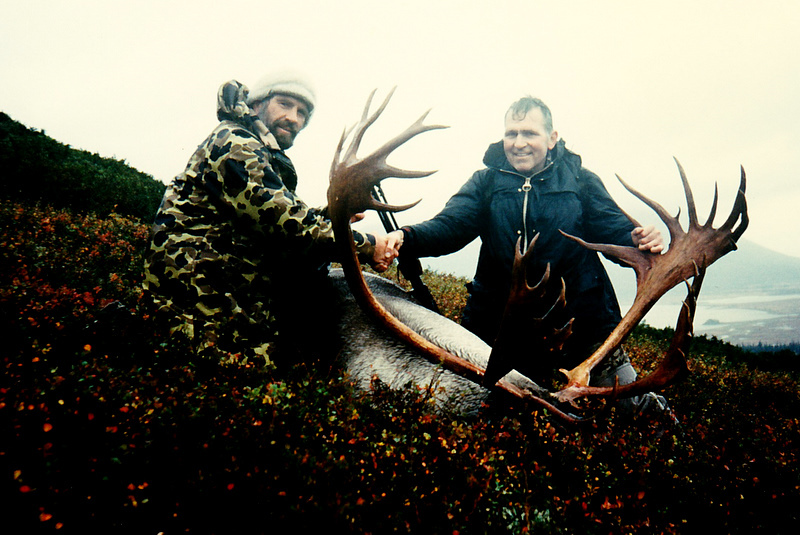 The caribou herd was growing so fast that we started taking six extra caribou hunters on 5 day hunts starting in ’91. That meant I needed to hunt basically out of base camp more as a helper than the main guide. Frank Orton, age 12 from MN with his 399 1/8 B&C caribou. However, in ’92 the whole Orton family came up to hunt caribou and I definitely wanted to spend a few days hunting with them at what we called “Alderville” on the Klutuspak Creek, where Karen had taken her caribou. Ron Watts and the late Marty Phelps helped guide all of them. All four harvested a trophy caribou with the largest being taken by twelve year old Frank Orton. It scored 399 1/8 B&C, less than one point from making the record book. It was a wonderful family hunt. Once they left I guided Rich Portis from NC to a 404 B&C Record Book caribou that he shot from the Otter Lake runway. We hid behind the 30” Air Streak tires that were on the “super cub.” It doesn’t get any easier than that. Rich Portis from NC with his 404 B&C Record Book caribou. After that year whenever I wasn’t flying I just went out with one of the guides who was guiding out of base camp. In ’93 I was with Steve Lanphier when Bob Wittman, MT took his 395 B&C bull. That year AAA took eleven B&C Record Book caribou. In ’95 I was with Sagen when his client Mark Giese, WI took a really nice long beamed bull scoring in the 390’s. Next was with Dennis Byrne when Stan Bocian, IL and Mike Sweeney, FL took their bulls. (L to R) Mark Giese from WI, Sagen and me with Mark’s bull scoring in the 390’s. (L to R) Guide Dennis Byrne, Mike Sweeney, FL, and me not far from the Otter Lake base camp with Mike’s double shovel caribou. It was a real team effort right after the 9/11 attack when John Koldeway was guiding Dianne Hutchison from PA. It was John, Chris Moore, Jeremiah Simmons, Tom Losk and I. We were all in camp and I was grounded because of 9/11 so we all took off after her caribou. I’m sure she felt pretty special with all the guides and packers. She made a good shot and scored with a nice caribou. 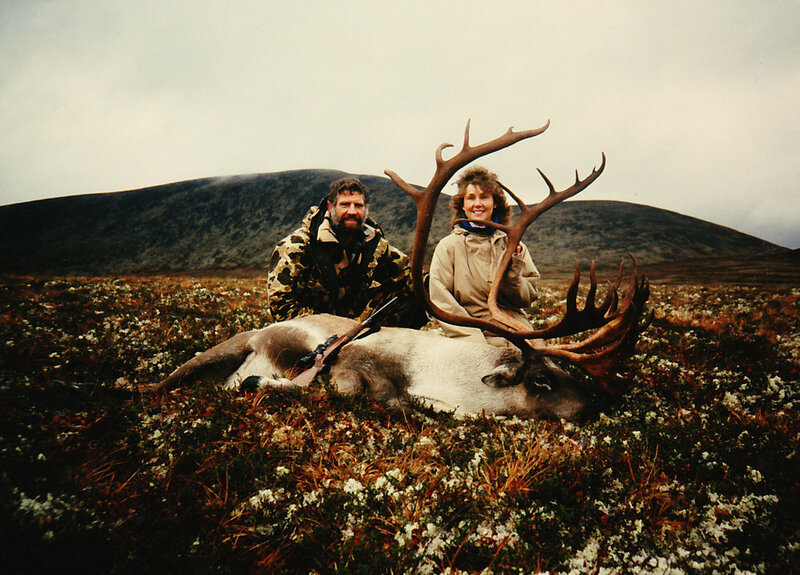 Dianne Hutchison from PA and guide John Koldeway with her caribou bull. I did guide one caribou hunter down at the Dog Salmon camp during brown bear season in ’95. Dan and I weren’t flying one day and Brent was guiding two clients on a (2x1) caribou hunt with one of the hunters also hunting brown bear. I spotted a good caribou bull high on the hillside above the brush line so we told Brent we would take him. It was a pretty tough go but once we got on the ridge the hunter, Chester Lewis from VA, made a great shot right at dark. It took us a while to get off the mountain but we had a good trail. It ended up being a couple miles with flashlights loaded with fresh caribou meat in prime bear country. But that is the life of a guide. Guides end up walking in the dark more than they want to that’s for sure. Chester Lewis from VA with his Alaska Peninsula caribou. A long dark walk out. Just returned from my whitetail deer hunt in Illinois with my friend Matt Caldwell. Took this heavy 10 pointer with stuff (3 extra points) at 36 yards with my Ten Point crossbow. Great hunt!